This post is an ode to my maternal grand parent’s house and visits to their house during summer holidays. My maamiji makes the best Sindhi Kadhi and I can’t stress how good and firmly the flavours remain etched in my mind till date. My other favorite recipes from her kitchen are Bharwan Bhindi and Besan Bread. Maamiji used to spoil all us kids with treats from her kitchen. I remember we all used to assemble at their terrace, fly kites or play some silly games and she used to get us onion bhajjis and bread pakodas with ketchup. After relishing those hot snacks, we used to queue up at a shop which used to sell coloured popsicles in different flavours. I used to go for Kaala Khatta always. Ahh! Those were the good old days. Nostalgia is precious! Off to the post, I have always found Sindhi cuisine very underrated. It needs to be given it’s due. My favourite Sindhi cuisine recipes are Sai Bhaji, Koki Paratha, Lola (you read it right, that’s what it’s called! ), Dal Pakwan and Sindhi Kadhi of course. I have been fortunate to have many Sindhi friends while growing up. Later on our extended family also welcomed my cousin bhabhi’s who were Sindhi. The best part about Sindhi’s is that they really love their food and are happy, good at heart people who value close bond with families and friends. That’s just how Punjabis are! Alright! Enough of family melodrama from my side, on to the recipe. I am not sure if this is the best recipe for a Sindhi Kadhi however this surely is loved by my family. In a frying pan heat some oil, add lady fingers, carrots and cluster beans and sauté them for a few minutes until they are soft. Take them off heat and set it aside. In a thick bottomed vessel, heat some oil and add mustard seeds, fenugreek seeds, cumin seeds and curry leaves. Once they splutter, add finely chopped ginger followed by green chillies. Sautee for a bit and add besan. Roast it in oil until it becomes fragrant and gets a new brown hue. This usually takes 5-8 minutes. Keep stirring the mixture else the besan can stick to the bottom of the vessel and get burned easily. Add the drumsticks, potatoes and the sautéed vegetable mixture to the mix. Add pureed tomatoes and cook them well. You can add all the spices, tamarind paste to the mixture at this point and give it a good stir. Add water and let this simmer away for 20-25 minutes with a lid on. Keep stirring the mix at regular intervals. Once it has reached your desired consistency, take it off heat. Serve with fluffy basmati rice, papad and some aloo bhajjis. 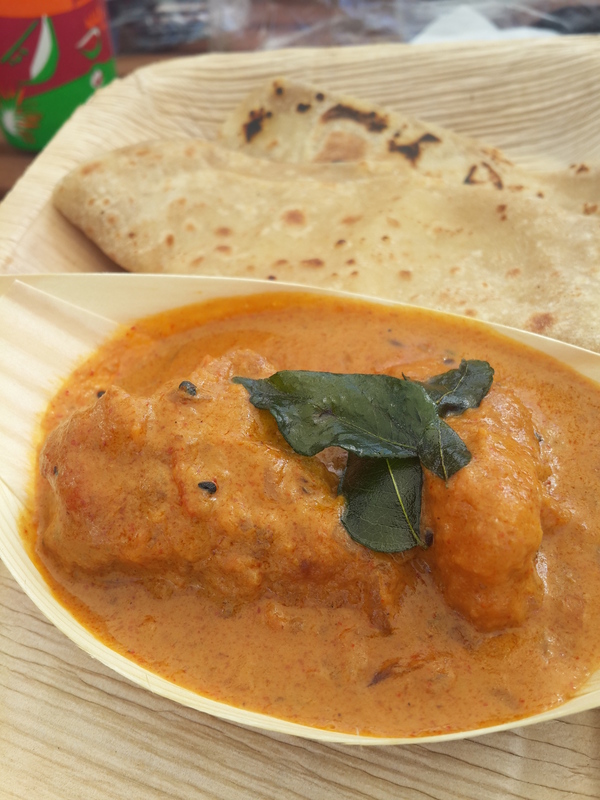 The Dubai Food Carnival happened earlier this month and brought back memories of the lovely time I had there. This was almost 10 months back but today when I glanced through the pictures, the memories of that wonderful afternoon spent seeing my culinary idol came rushing back! I hesitated posting about my experience for the longest time but then reminded myself that this blog is my journal for the highs I have had when it came to my blogging journey. So here I share this great moment with you all before we see another edition of the Dubai Food Carnival. So how did this all begin, read on. Facebook contests have been lucky for me (touchwood!). 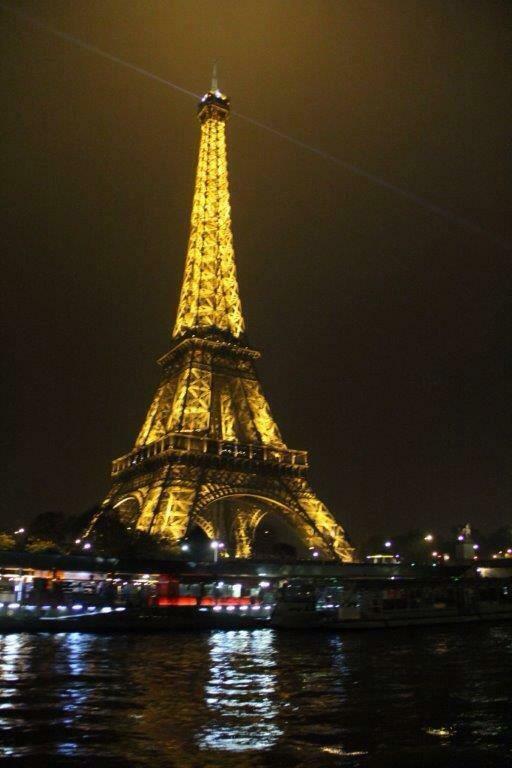 I got to travel on an all expense paid trip to Paris and Amsterdam late 2013 and I thought nothing gets as awesome as this. 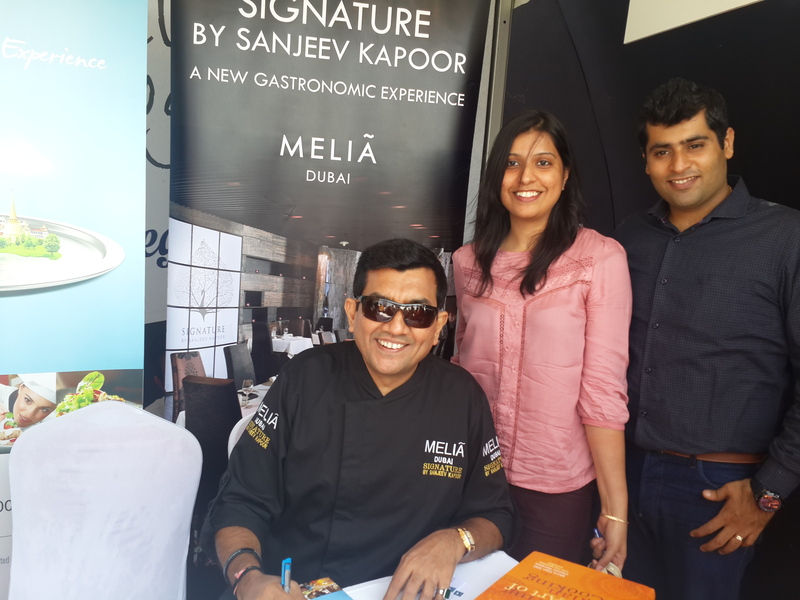 And then cut to late March 2014, I saw this contest by Melia Hotel about a Meet & Greet Opportunity with Sanjeev Kapoor, a complimentary meal at his much acclaimed restaurant Signature at Dubai Food Carnival. I participated with bated breath and to my utter amazement I won the chance. I had anyways bought tickets for Dubai Food Carnival to see his cooking demonstration. 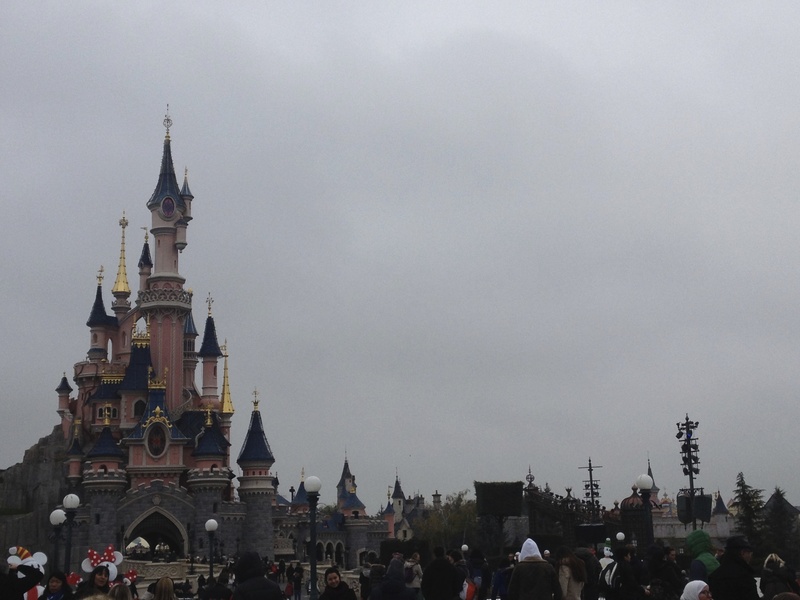 I rushed to collect the winner’s pass and was a bundle of giddy nerves until next afternoon. The cooking demonstration started and Chef Sanjeev mesmerized everyone with his humble anecdotes and stories. The one thing which stuck me was how grounded and unassuming he is about his success. Maybe this quality is what has helped him reach where he is now. The best thing is how he likes to keep things and food simple. 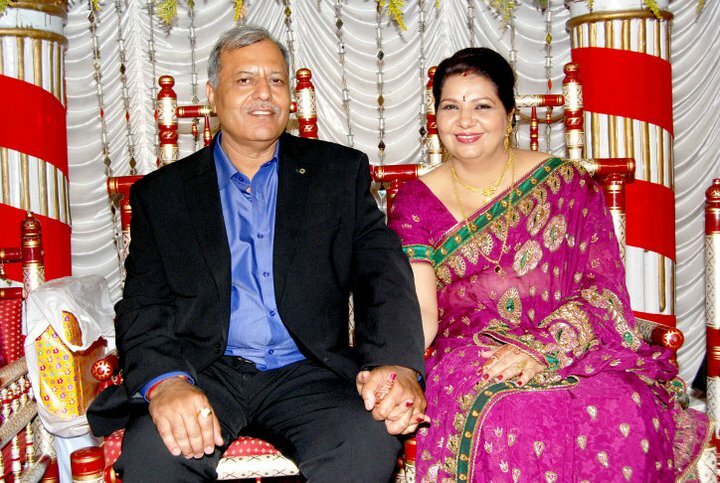 He discussed how his wife makes the best biryani and fondly remembers the tasty Gujrati food his mother-in-law makes. The funny re-collection of his encounter with dealing with the myth that Indian food is spicy and just loaded with chillies, when he was working in New Zealand. The dish turning out to be a bestseller on the restaurant menu after a customer requesting to make it spicier over there was quite amusing. Midway through the demo, he showcased how simple tweaks to the way simple ingredients are handled can help home cooks create restaurant style plating and garnishes. He asked someone from the audience with good knife skills to volunteer. I jumped at the opportunity. With shaking hands, he handed me a potato and asked me to make cuts similar to a hassle back potato but in a nice square shape. Call it stage fright or me being star stuck with him around, I managed the cut well but forgot the square shape. He being the gentleman simply complimented me for the knife skills and getting the cut right. He jokingly said that here I will gift you the knife, if the organizers allow me! Also take this opportunity to thank Joselin from Melia Hotel and the great team at Signature by Sanjeev Kapoor. 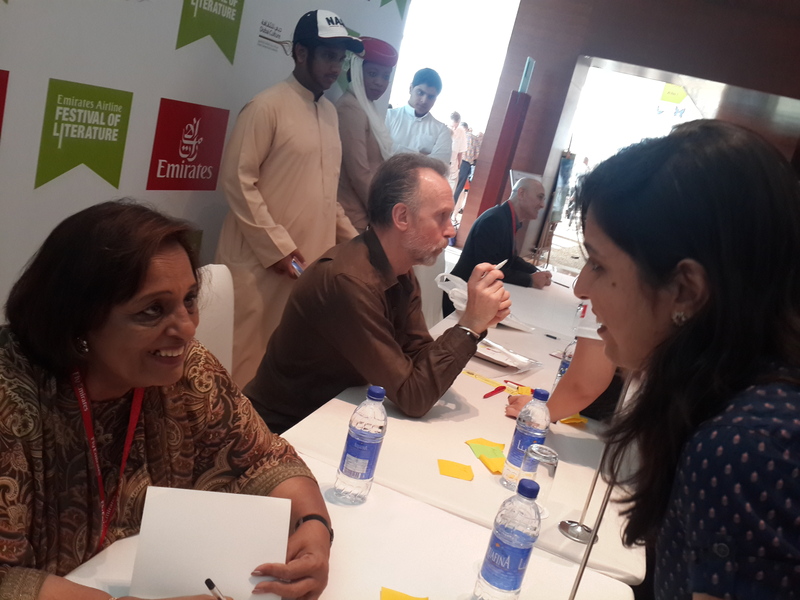 As a part of the contest, I was also treated to a meal at their stand at Dubai Food Carnival. 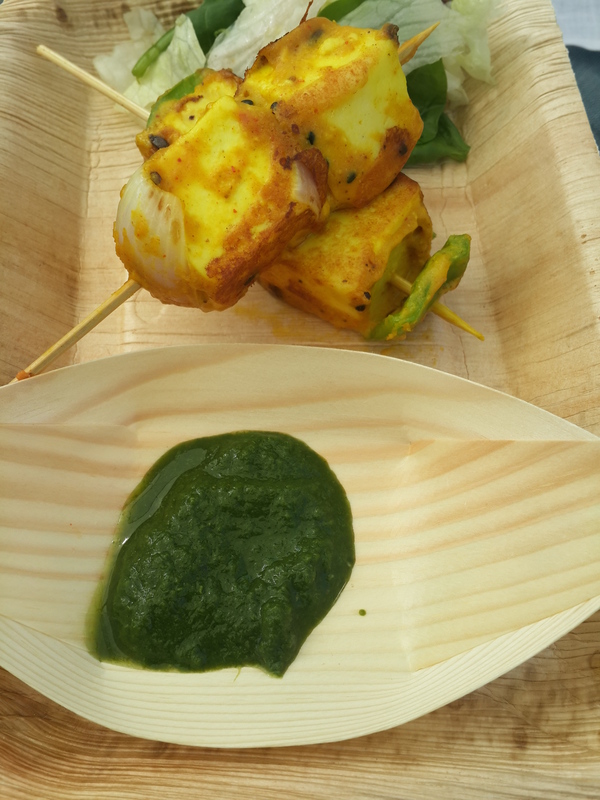 I loved the Makai (Corn Flour) ki Roti, Sarson Ka Saag (Cooked Mustard Greens) and the Paneer Tikka Masala they did. 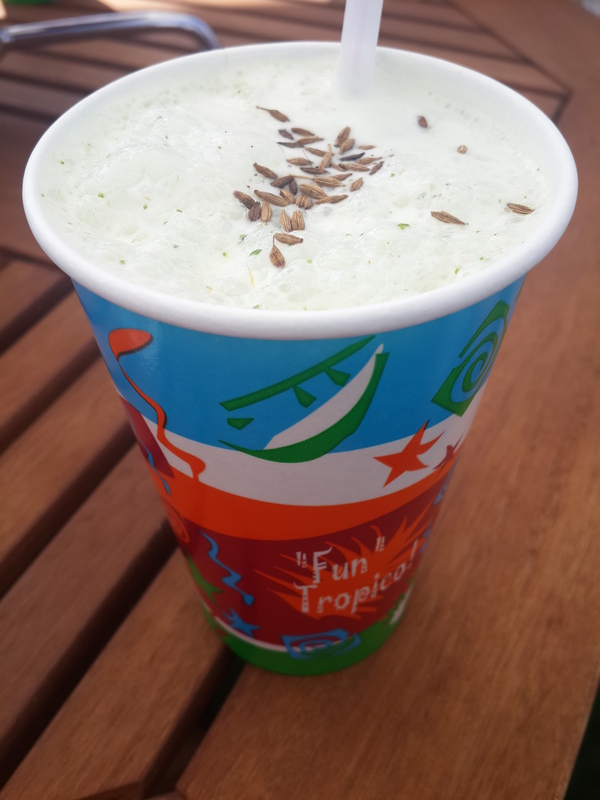 The revelation was the Lemongrass flavoured Buttermilk topped with roasted cumin seeds, very refreshing! 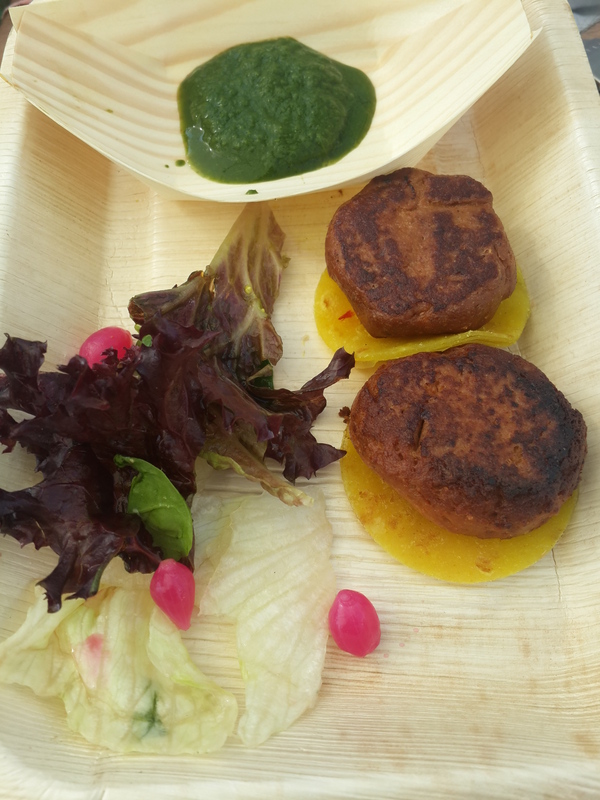 Sahil had some meat dish and Galouti Kebabs and my man was grinning! 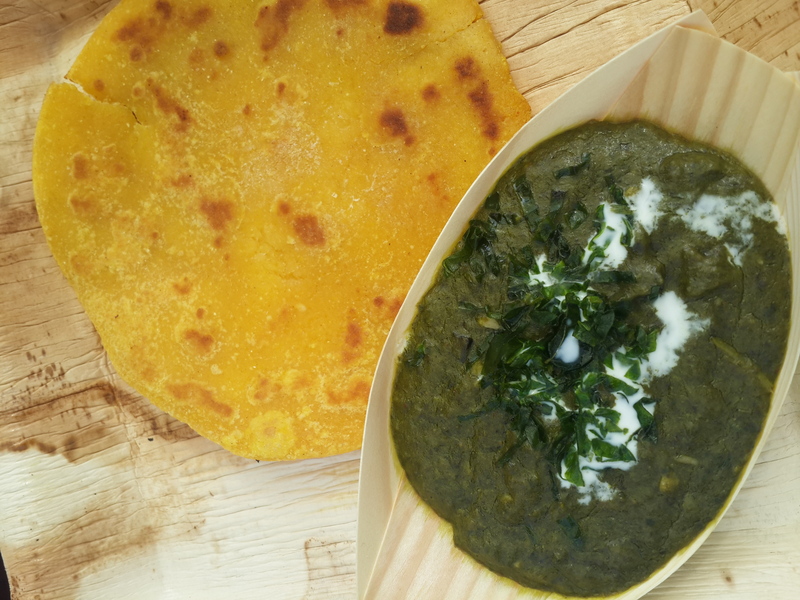 Apart from that I was also craving Sarso Ka Saag and thought of the one I ate at Chef Sanjeev’s restaurant stand. Utterly delicious with the Makke Ki Roti topped with white butter! Apart from this I also got all my cookbooks signed by the chef extraordinaire. It makes me happy every time I flip open one for some inspiration. Next time around August last year, I got a chance to see Chef Sanjeev Kapoor at his restaurant “Options” while they were hosting the Independence Day Dinner. While we spoke, he gave some honest life lessons in embracing positivity in life and taking the burnt toast with a smile. More food stories to follow as I do a round up of events I attended in 2014 and how it was one eventful year! It’s a moment of rejoicing as my humble blog completes two years this week! 26th October that is. I’m grateful to all of you who read my blog and encouraged me to write/cook. I’m a tad late in posting this since did not have Internet at home for over 5 days. The past year has been quite an enriching experience, with the learning curve being the steepest. Getting more serious to hone my skills, I have frenetically gone beyond my comfort zone to learn new techniques, all the while splurging heavily on new equipment and cookbooks, experimenting with new ingredients, cooking a lot more and, as fate would have it, had the chance to meet my culinary idols as well. 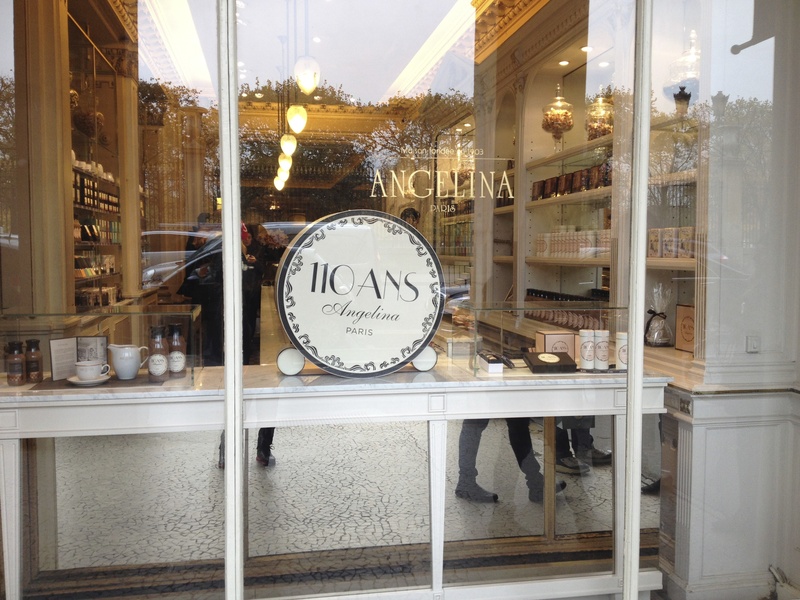 The icing on the cake had been the trip to Paris which is a dream come true for any gourmand. 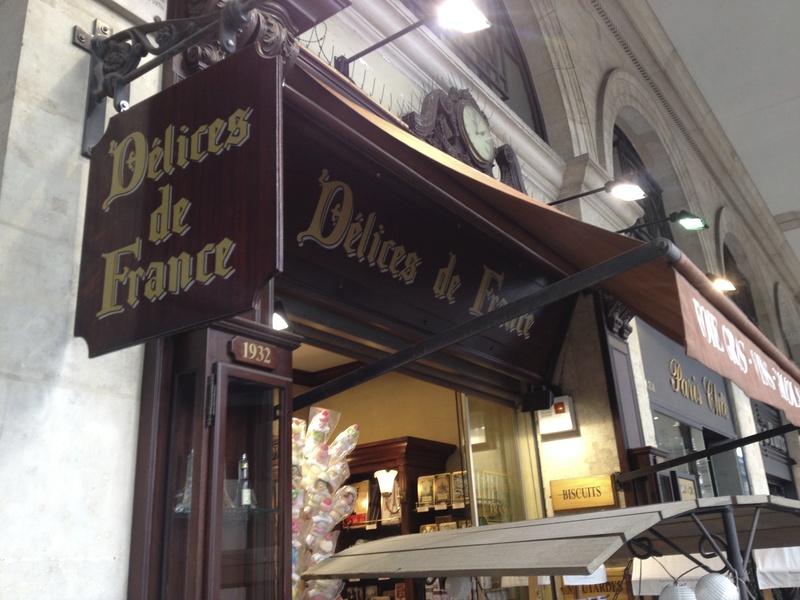 Since my interest lies in baking, there couldn’t be anyplace better than Paris to savor the finest of the patisserie and desserts. 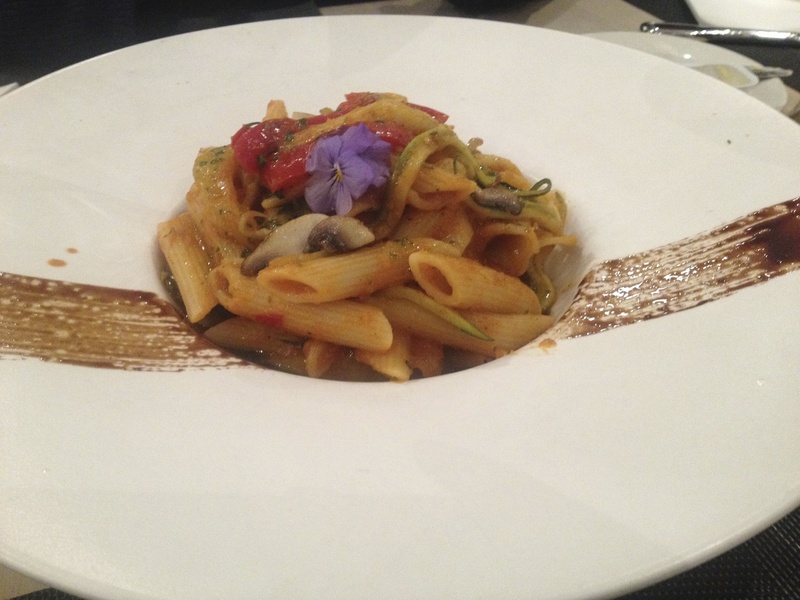 Apart from the sightseeing the beautiful city, I was most ecstatic about the gastronomic heaven I was about to delve into. 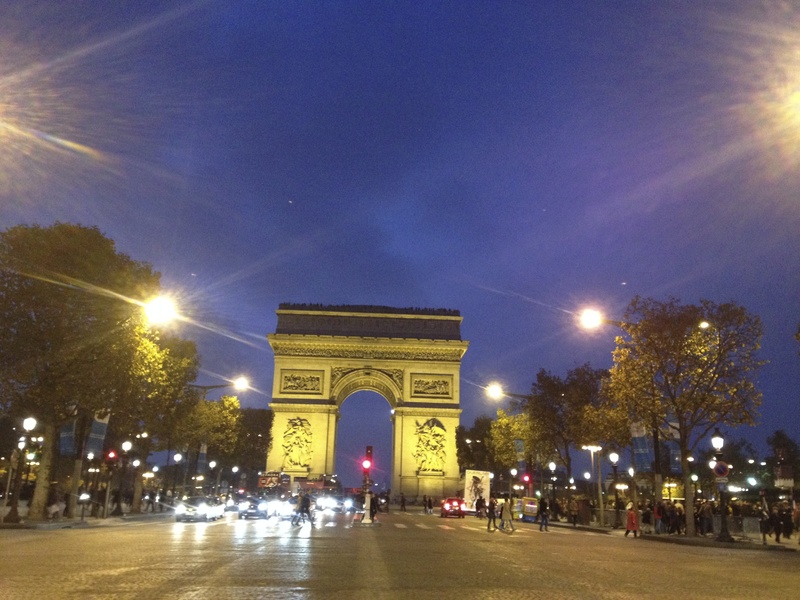 I had a fantastic experience visiting the quaint little cafes on the park enroute to Louvre and savoring the best of the world at the oh-so-elegant Champs-Elysées. 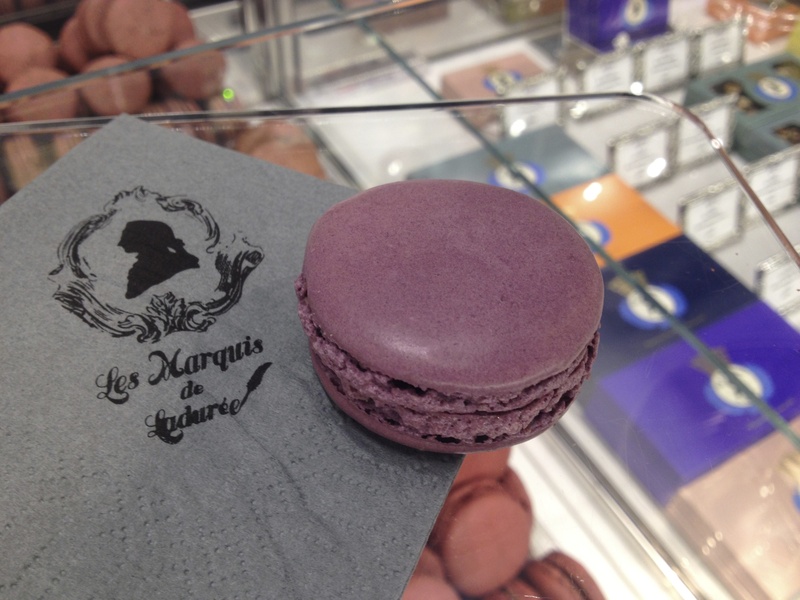 One gastronomic memory that would stay with me forever would be the visit to the iconic Cafe Angelina and the heavenly macaroons from Les Marquis de Ladurée. 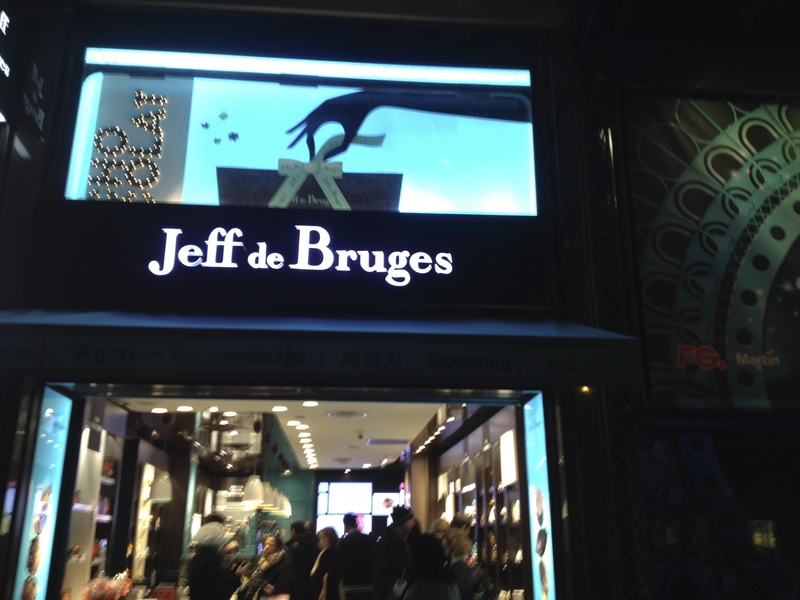 Galeries Lafaytte and Jeff De Bruges tempted me to splurge beyond my means, as I packed in gifts for co-workers and family (Damn the baggage allowance of airlines). 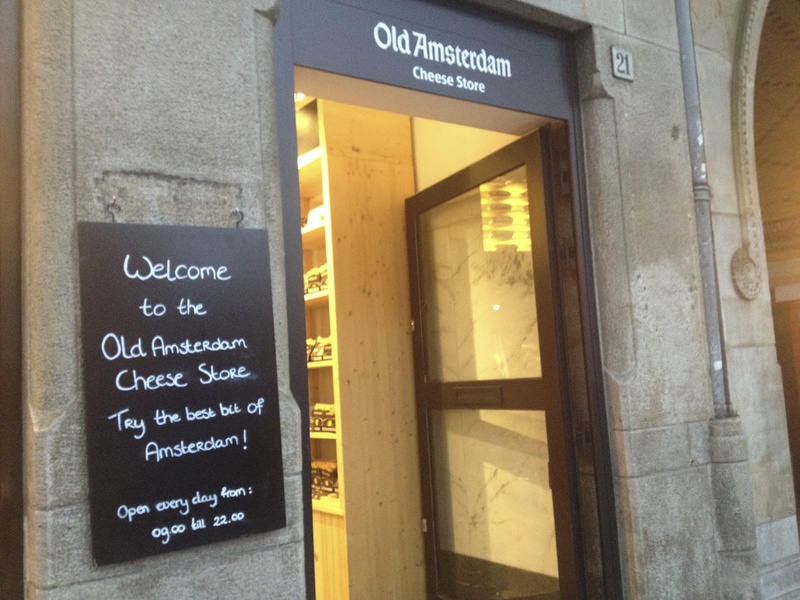 Having Amsterdam in transit was a blessing in disguise, as a world of artisan food awaited me. 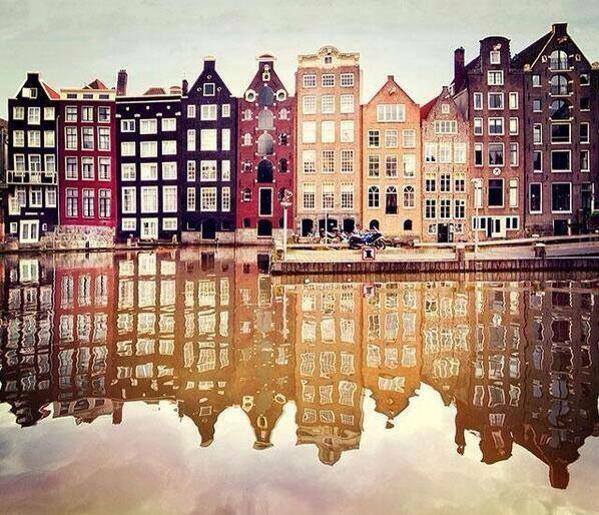 While the mindboggling variety of cheese from Dam Square had me go overboard, the hot chocolates and Stroopwafels ensured I come back to the beautiful city someday to savour more delights with the husband in tow. 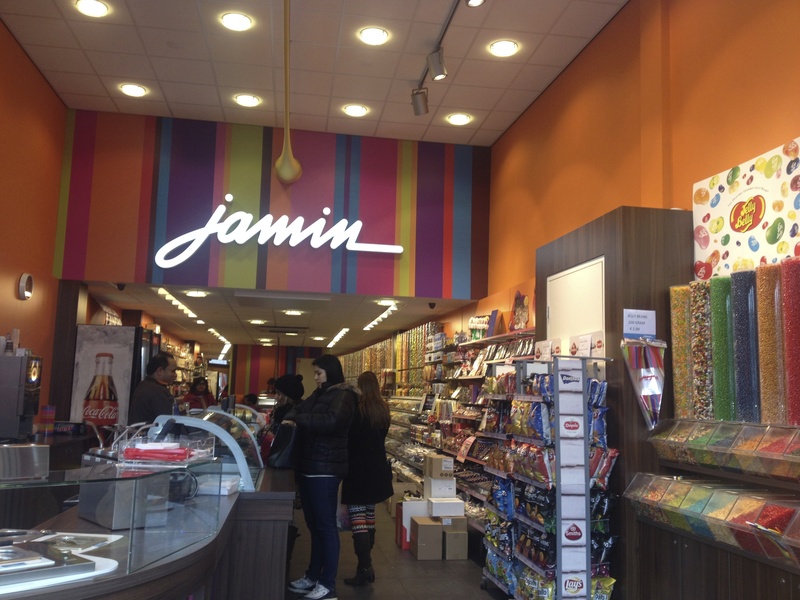 Noteworthy of the stores I visited were the Old Cheese Shop and a small chocolate shop named Jamin. 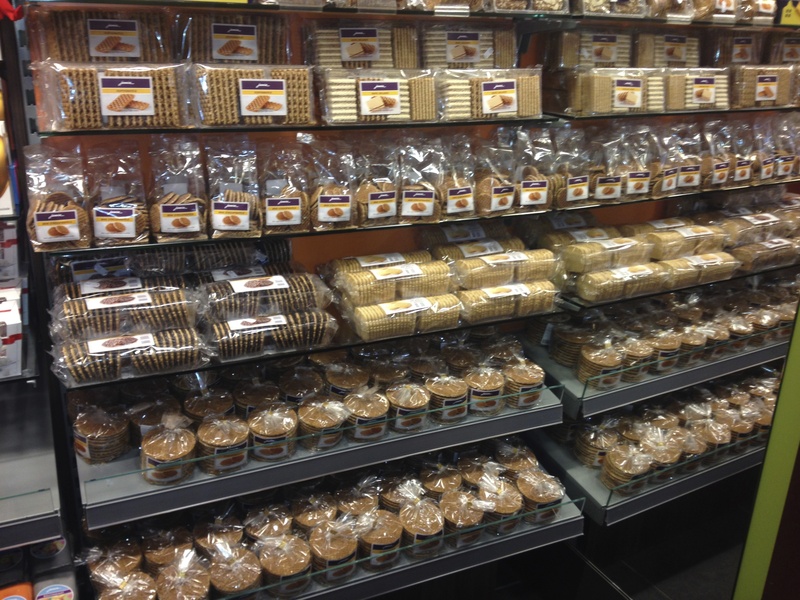 My baking supplies for the next few months were taken care of thanks to the splurge in Amsterdam! While Paris & Amsterdam might have introduced me to many new & unique gastronomic treats, the trip back home to India after few months taught me few more lessons in authentic cooking. 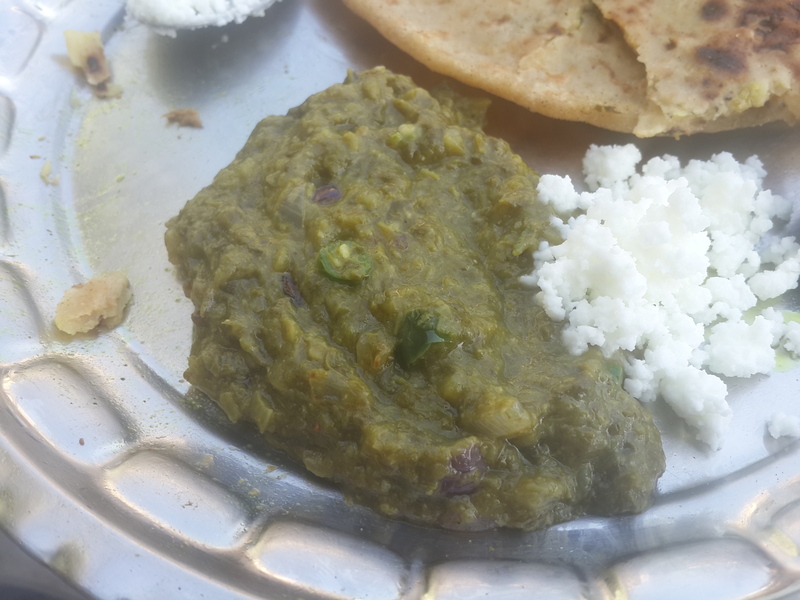 A road trip to Punjab was a rich condiment of heavy-duty food, making me realize that good food sometimes is very simple (as cooked in villages), and sometimes it’s quite technical like served at high end restaurants. 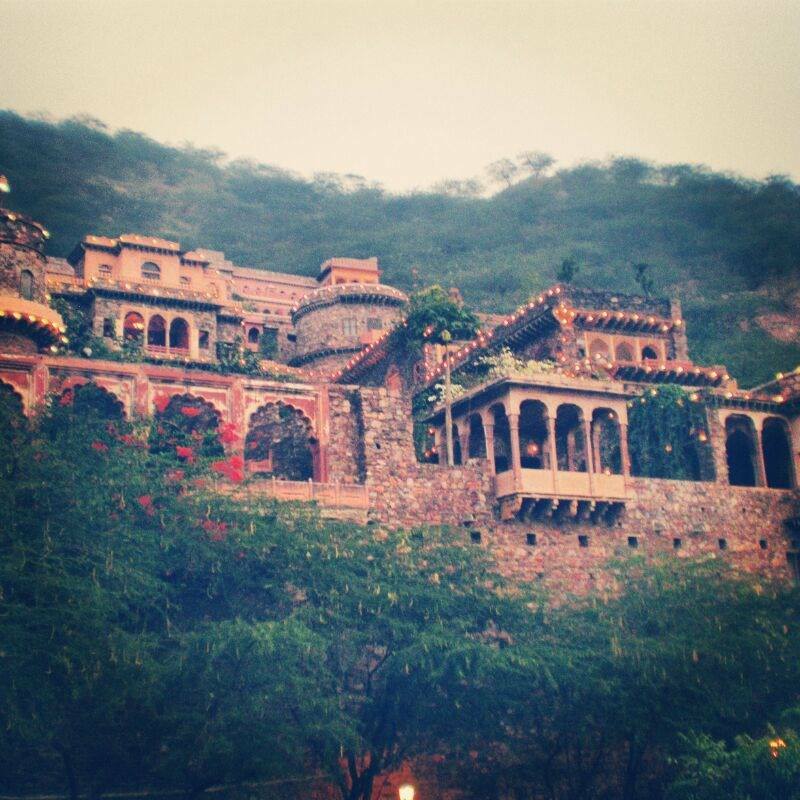 Another road trip to Neemrana Fort was an absolute delight, where the expansive Thali served is a food fit for nobility. 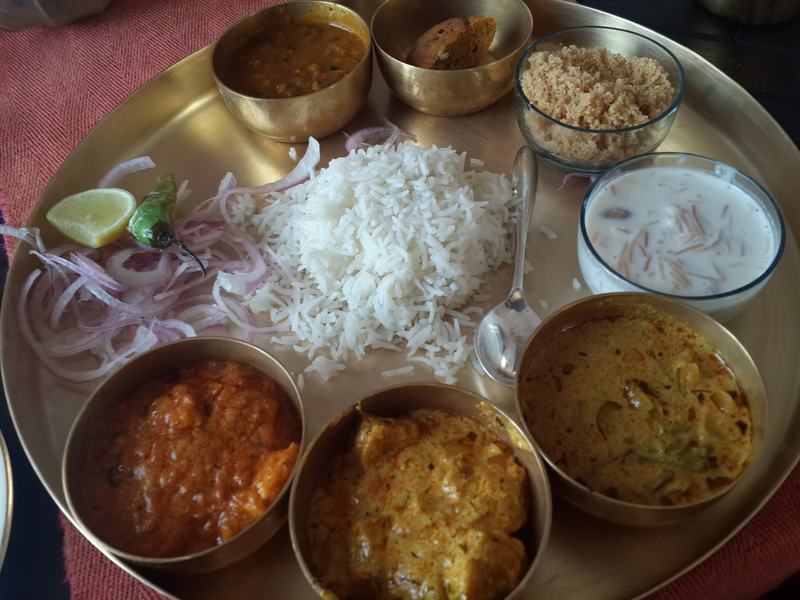 The Rajasthani cuisine there is something to write home about. 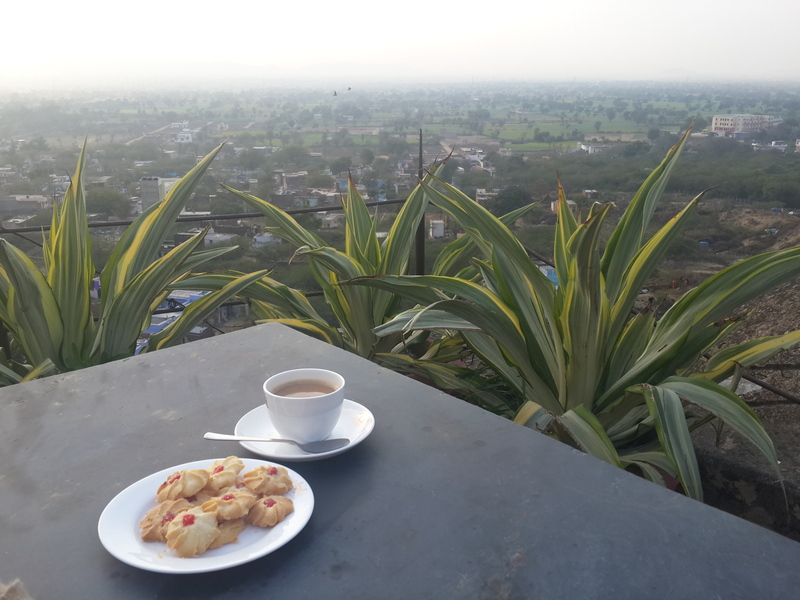 Sitting at the upper deck of the centuries old fort, taking in the stellar views of the villages & fields and enjoying the sunset is an experience that goes beyond words could describe. The year gone by was by far the luckiest for me, as I had the chance to meet many chefs whom I revere. To start with, I had a chance to meet my culinary idol Sanjeev Kapoor. I come from a household which watches his popular program Khana Khazana religiously and seeing him twice this year in person was a dream come true. 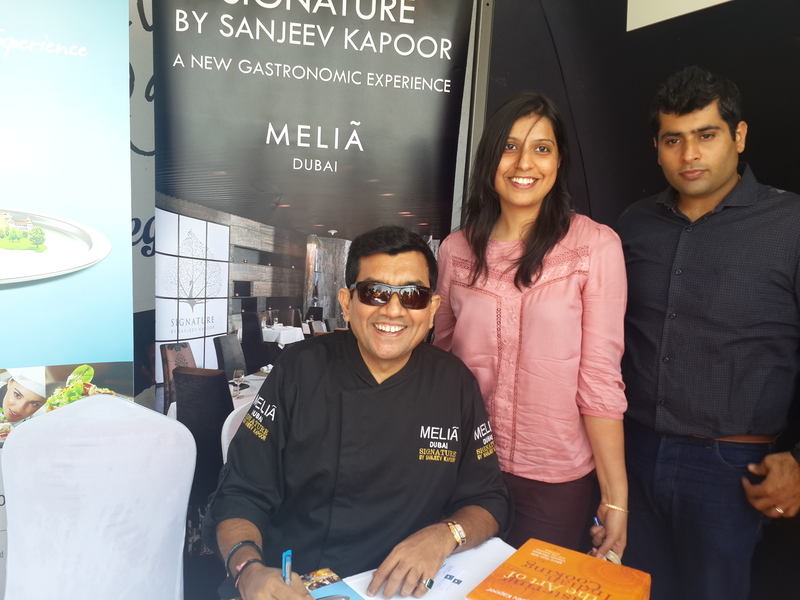 First at Dubai Food Carnival and later at the Independence Day dinner at his restaurant Options by Sanjeev Kapoor. Family back home hovered over the Whatsapp pictures I sent them from these events. Interacting with him made me realize that whatever heights you reach in culinary stardom or whichever field you represent, being humble is the quality that never ceases to attract most. In just a few minutes, he taught me some life lessons, the best being: If you dream of doing something, then do take the risk and pursue the passion. Do not wait for the perfect timing and remain positive at all times! 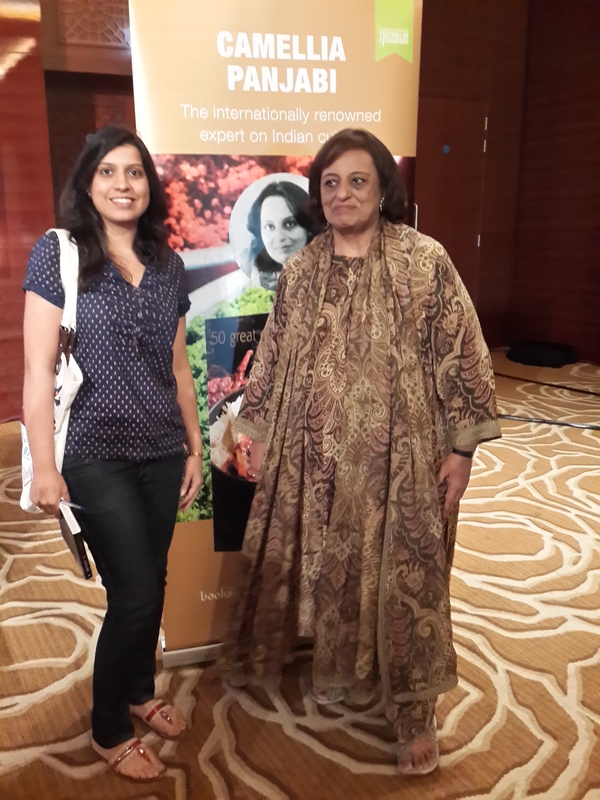 Another personality I adore and met was Camellia Punjabi, as I attended her cooking demo session at the Emirates Literature Festival and was blown away on simple kitchen hacks that would sort out your weekly meals. 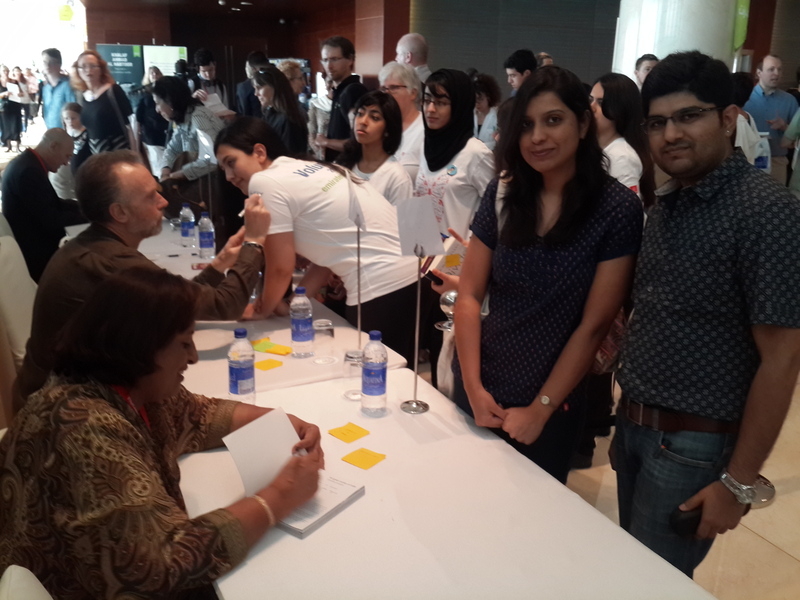 Sahil and I had a very candid chat with her as she signed her cookbook for us. We had a great time discussing how she feels that true traditional fare is a rarity to find in restaurants these days and how average dishes get passed on as gourmet food. We asked her to write a new cookbook to which she gushed, while she found it amazing to see a young couple cooking together and bonding over food. She was brilliant! 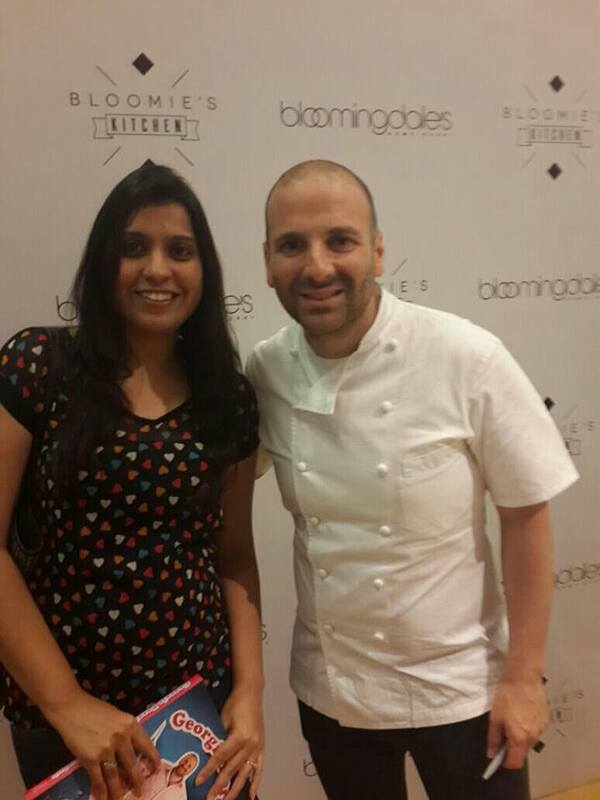 Finally, after watching so many seasons of Masterchef Australia, I had the honor of attending a cooking demo by Chef George Calamboris himself, and relish his wonderful food. He is a magician and enthralled the crowd with his wit and humor. 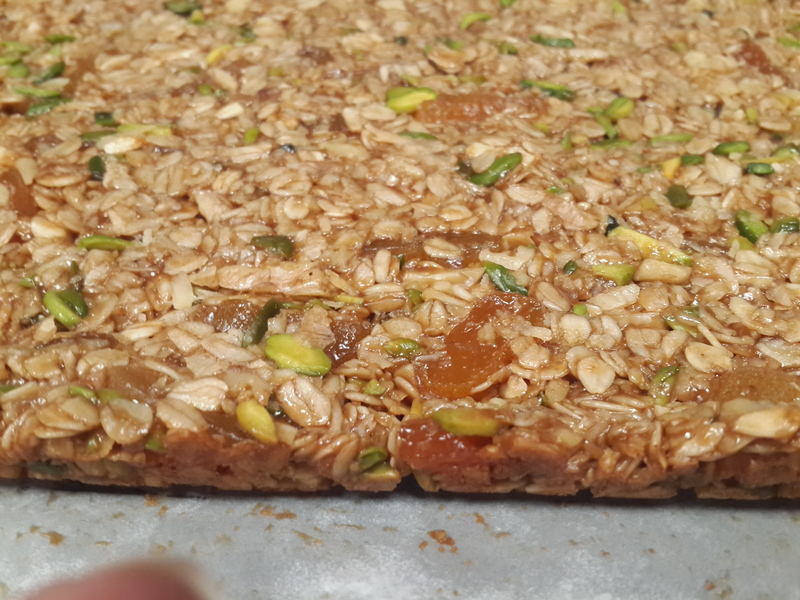 The past year also saw me get busier with requests from friends to make mithais (sweets), cakes, granola bars and biscotti’s. Their belief in my culinary skills was heartwarming, and I tried to do justice to that. 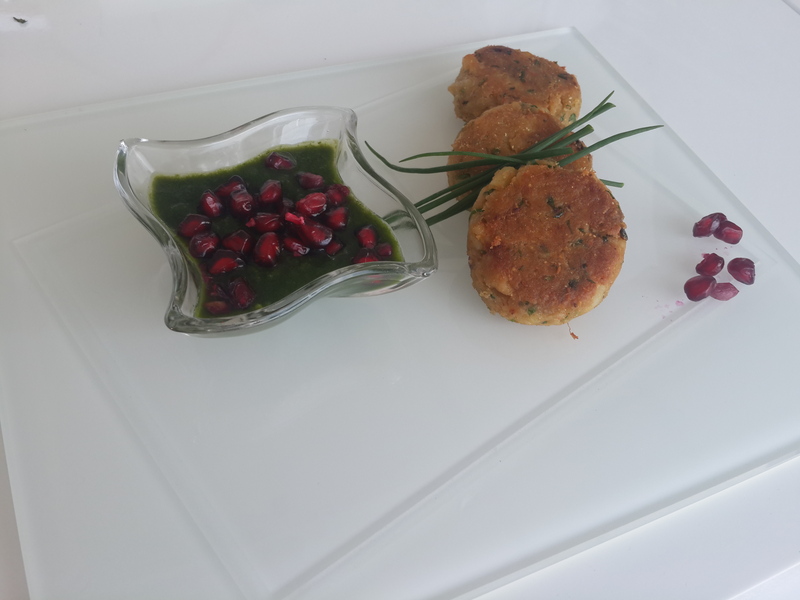 Hosting get-together and parties helped me learn more about timing, multitasking and plating. 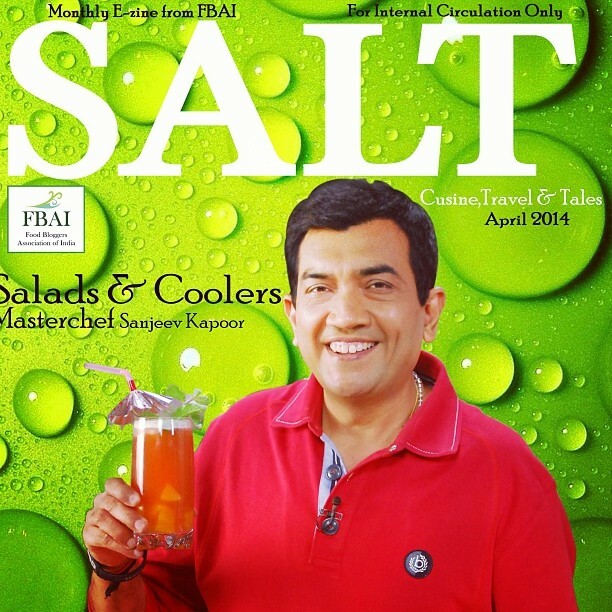 I had the pleasure of having my first ever article published in SALT back in April, a monthly e-magazine by the prestigious FBAI (Food Blogger’s Association of India). I personally take the opportunity to thank Mr. Sameer Malkani, Founder FBAI and Mr. Elson Sequirera, Editor FBAI. At the time of writing this article, I have submitted another article which is due to be published in their upcoming issue. All in all I feel happy looking back on each of the milestones. 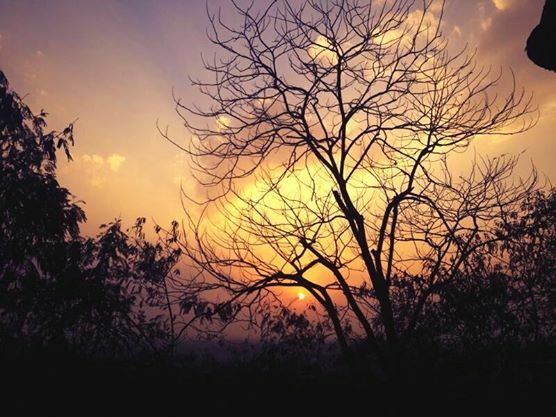 So what are the key mantras for the year to come? I have prepared a mental list of sorts. That is one thing I am good at, making lists. However I need to follow them to the written word a lot more. I am going to try not to wait for the perfect prose to go along with the blog posts. I will not look for perfection, but post as and when I cook. The fact is I cook much more in real life than I get to post about. I am going to not procrastinate further on sharing my kitchen diaries with everyone. I humbly take this opportunity to thank everyone who made this journey of blogging such a joyride. Your each comment, social media mention, email, message and likes mean a lot to me. It makes me feel that I am doing something good out here. Thank you once again and until next time happy cooking! It’s such a great feeling when my mum, friends or cousins call me to say that they like what they read. My best supporter has been my grandmother who relies on the translations my mum gives her for my writing. It’s funny when she asks me to Whatsapp her pictures of something new I cooked or baked. She is tech-savvy that way. Ain’t she the coolest grandma ? She loved every picture I clicked at my Italian cooking class, she found the Pasta machine quite exciting. This makes me very proud since she is my mentor, she is the one because of whom I first held a chopping knife or learnt how to make a dough. I owe my love of cooking to her. I have hosted many dinner / lunch / brunch parties to bring in someone’s birthday / anniversary / promotion / farewell or just catching up with everyone. Friends and family been very supportive and let me take pictures before digging in to the feast. They do email me recipes, they want me to try out and feed them. I like how I got to make some really good friends bonding just over food. I also did get to introduce some non-Indian friends to Indian cuisine and now it’s wonderful to see how they enjoy it and ask for that white pancake recipe while referring to Dhokla. Dining out on weekdays when I’m too tired to cook after a long day at work came in it’s own pleasures. It gave me and Sahil with some alone time to catch up with each other. We also did a round up for nearly most of the coffee shops. This habit came into being since the very beginning of starting our expat journey here, we do weekend coffee dates just before hitting the supermarket for our grocery shopping. 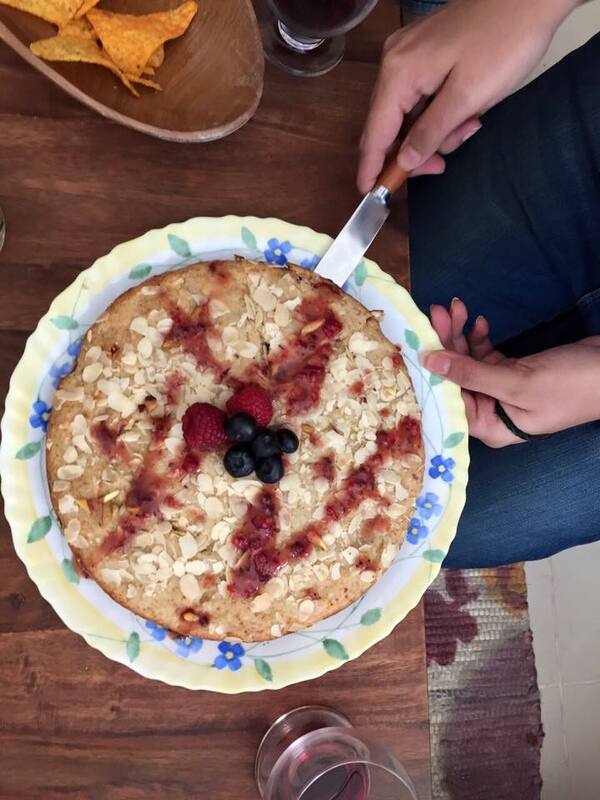 The first year meant experimenting, getting conscious of the responsibilities which come in with having a food blog. Spending Thursday nights curled up on the couch reading up food blogs or wandering over food websites, buying cookbooks or baking supplies over a pair of shoes, having a window open for The Kitchn while at work, bookmarking favorite recipes, testing the recipes and trying to get across the same emotions into writing as I felt while cooking the recipes. I learned and listened to many people share their food stories and philosophy, letting me in to their personal space and asking me about mine. I think during the course of the year I came across some really fantastic people be it the restaurant owners when we go out to dine, asking them about their foodie journey or fellow food bloggers who share same passion as me. I also got to be a part of the wonderful Fooderati Arabia group. 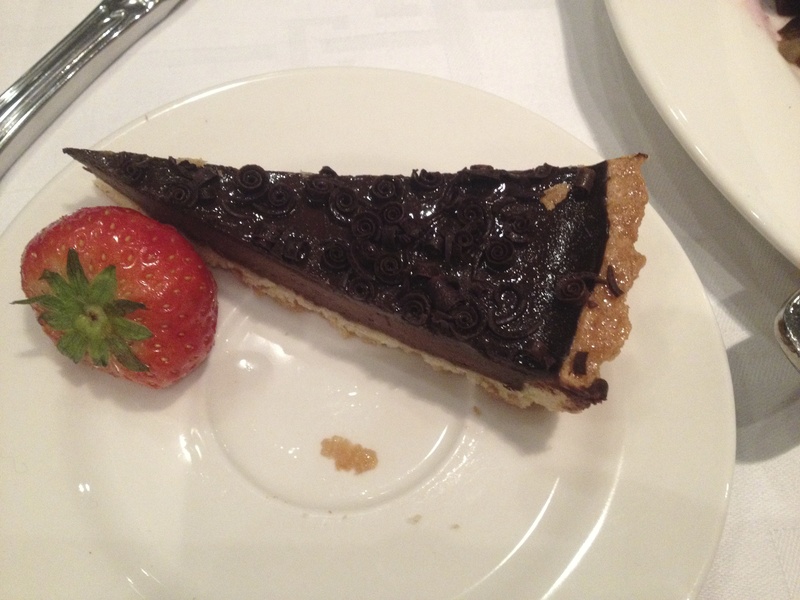 Attending fabulously put together food events and reading their food blogs. All of them have been such an inspiration. It’s been a fun ride so far. The year has passed by in a jiffy, I promise to get more regular with my updates for the next year. I have a better vision and clarity for this blog now. I hope the second year brings in more excitement and learning. p.s. 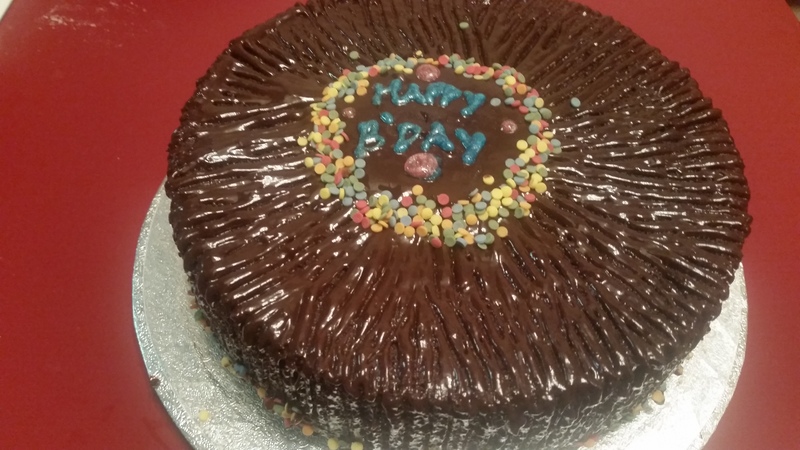 I have posted pictures for two of the cakes I baked this year for two very special people in my life. 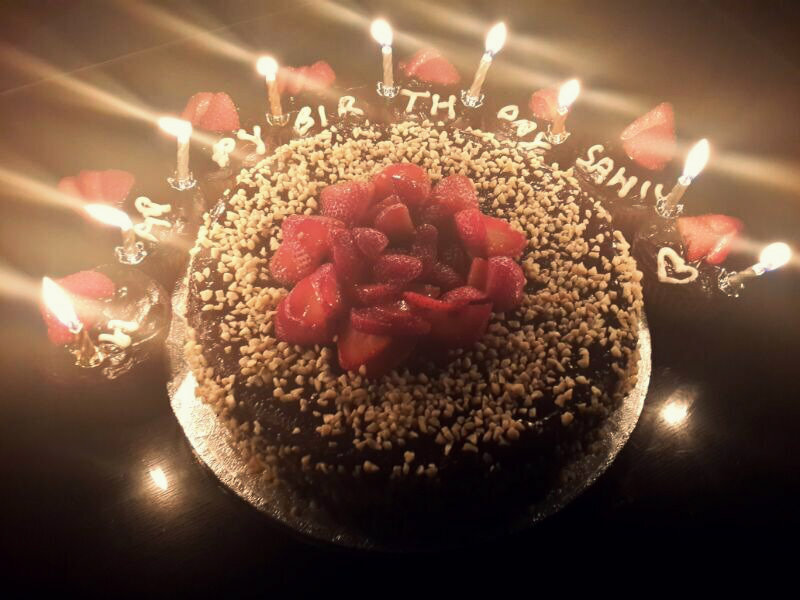 First is for a dear friend and second picture is for Sahil’s birthday cake! After a long hiatus I’m back with something sweet. 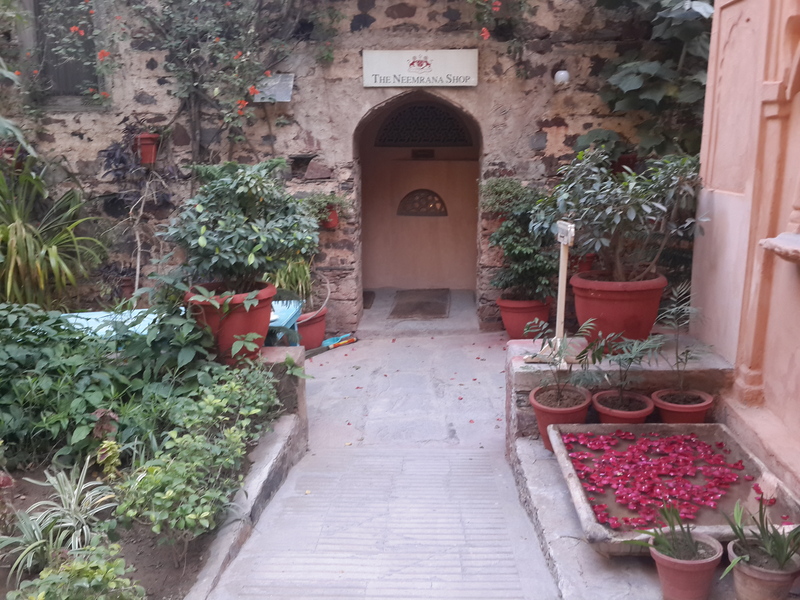 I visited my family back in Mumbai last month and spent 15 days of bliss in my room. Surrounded by the similar sense of warmth and comfort which can be experienced, only when you sit cross legged on the couch, endless rounds of tea and snacks been passed around with family gossip sessions which go on for hours on end. I planned this trip since I wanted to be there for my Dad’s birthday. I’m a typical daddy’s girl and he pampers me silly always. He is the one who still calls me and says ‘I Miss You, come back home soon’. He said this just before his birthday was approaching and it was enough to make me teary eyed and book my tickets. My dad has a terrible sweet tooth, one of the many things which I have taken on him. He has border line high blood sugar but he still hasn’t restricted himself much in terms of popping the usual ladoos and halwas. 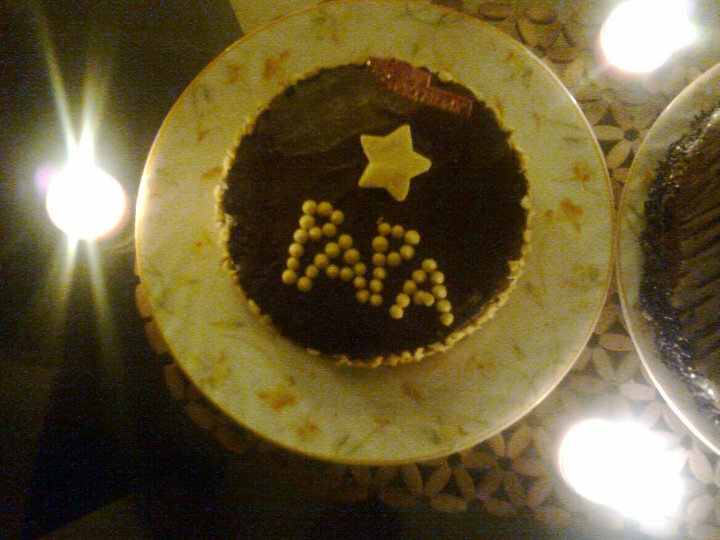 His Punjabi genes are to blamed for the same, as a family we like our desserts way too much. I used to bake cakes for him before I got married off. See the one I baked him way back in 2010. Last two years in a row I couldn’t bake him one and used to feel worse. 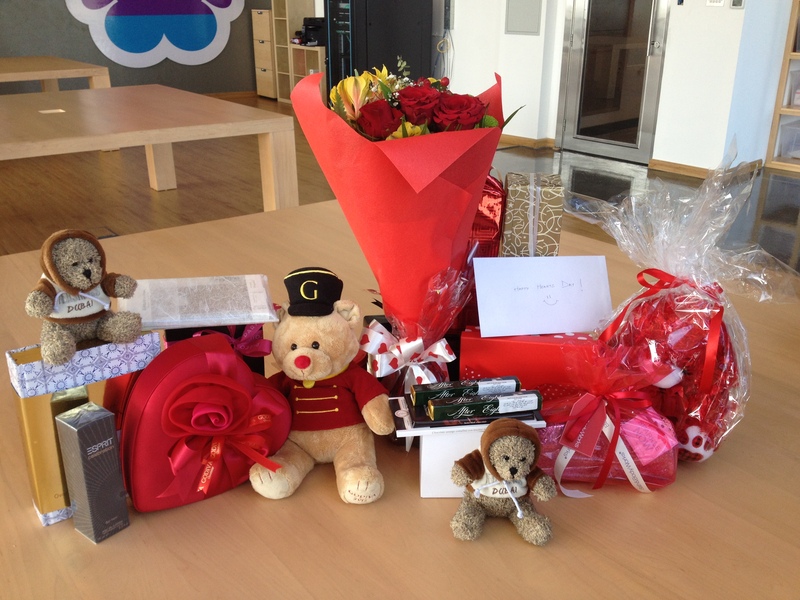 So this time around, we were quite excited to bring in his birthday together. 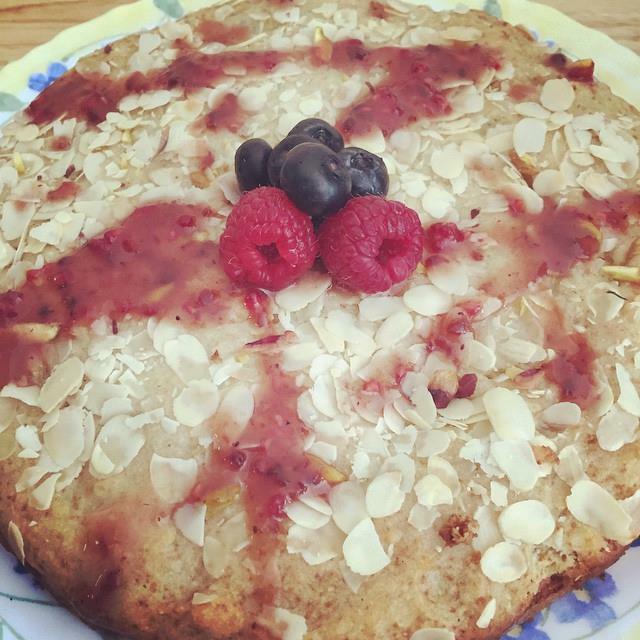 I went armed with an oven (my mum never bothered to replace the old one once it went bad after I left) and a healthy cake recipe. 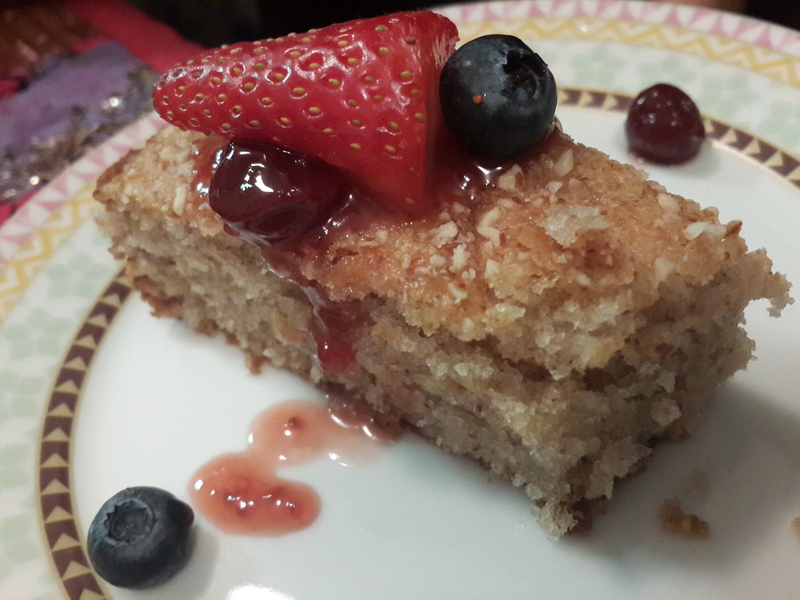 I made him an Eggless Vanilla & Almond Crumble Cake. 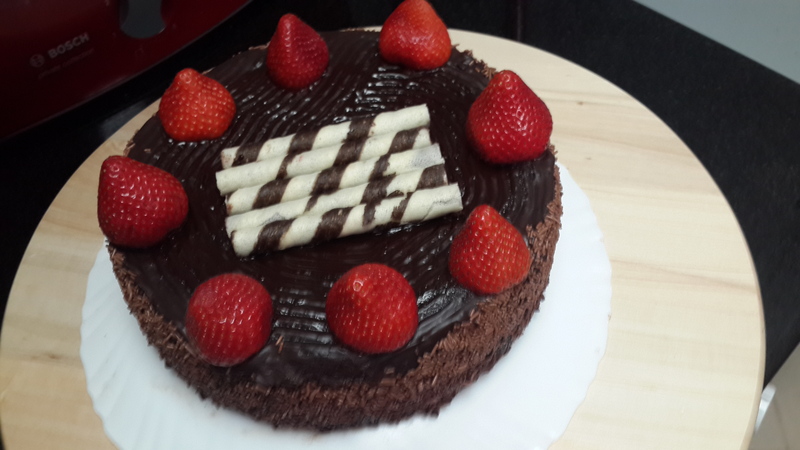 This recipe is adapted from Nita Mehta’s book – Eggless Desserts. This recipe calls for no butter and very less sugar. 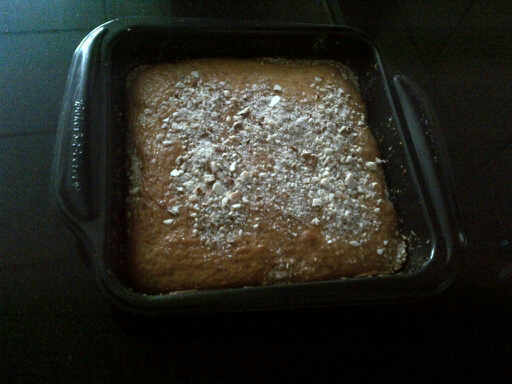 You can up the sugar up to 1 cup if you like the cake on a slightly sweeter side. The texture for the cake will be moist and not too crumbly. Today happens to my mum’s birthday, she turns the big 50 today. My mother is a compassionate person and a very confident lady, she is the life of every family get together and an agony aunt to the entire family. We can’t imagine our lives without her soothing smile. Here’s their picture taken on my wedding day. Preheat oven to 180 Degrees Celsius. Grease an 8″ cake pan with some butter, layer with baking paper on the base and set aside. Dust some flour on the sides of the cake pan so that the cake comes out clean once it is done. Whisk the yogurt (at room temperature) well and add the sugar to it. Mix well until the sugar is incorporated well. Sieve flour, baking powder and baking soda and mix well. Add this mixture to the wet ingredients. Add vanilla essence and and oil. Fold it well and keep aside for 5 minutes for the baking powder and soda to start working it’s magic. Pour half the batter in the greased cake pan and layer with the almond crumble mixture. Put the remaining the batter and sprinkle the remaining almond crumble mixture. To make almond crumble, soak almonds in warm water for 30 mins. Dry them well on a kitchen towel and crush them coarsely in mortar and pestle. Keep the texture slightly coarse and crumbly. If you want a crunch to the cake, then slip the blanching step and instead just coarsely chop almonds or give them a quick blend in the spice grinder and do not soak almonds in warm water. 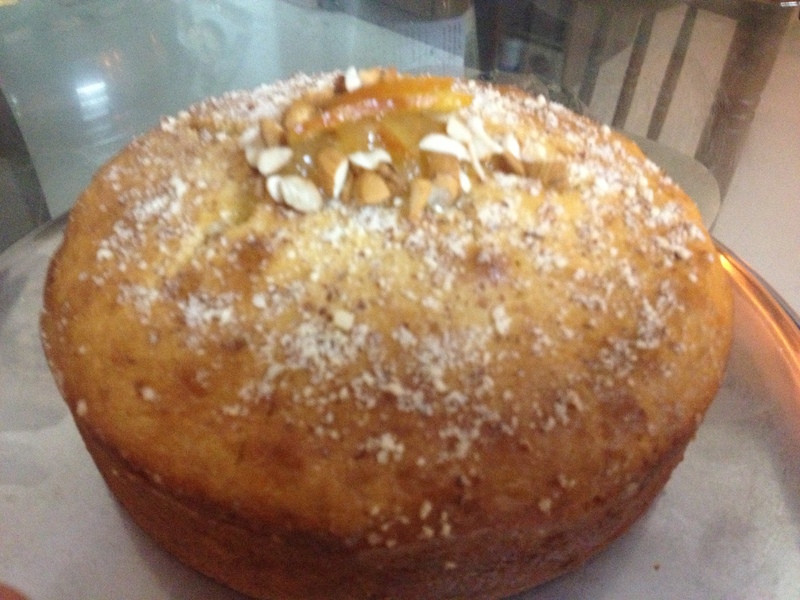 If you do not want to give the cake a layered look, then you can add the almond crumble to the batter and mix well. Bake in the pre-heated oven for 30-32 minutes until the top turns a golden brown and a tooth pick inserted into the centre of the cake comes out with clean. Let it cool down completely. 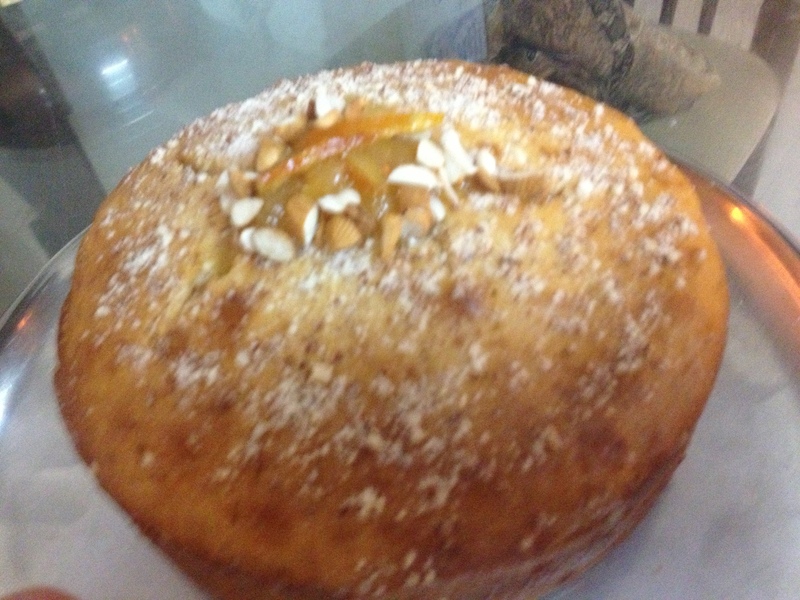 I took the Orange Preserve from La Pain Quotidien for my parents and garnished it with the same along with chopped almonds once the cake was cooled. You can also serve it with any other preserve you like. 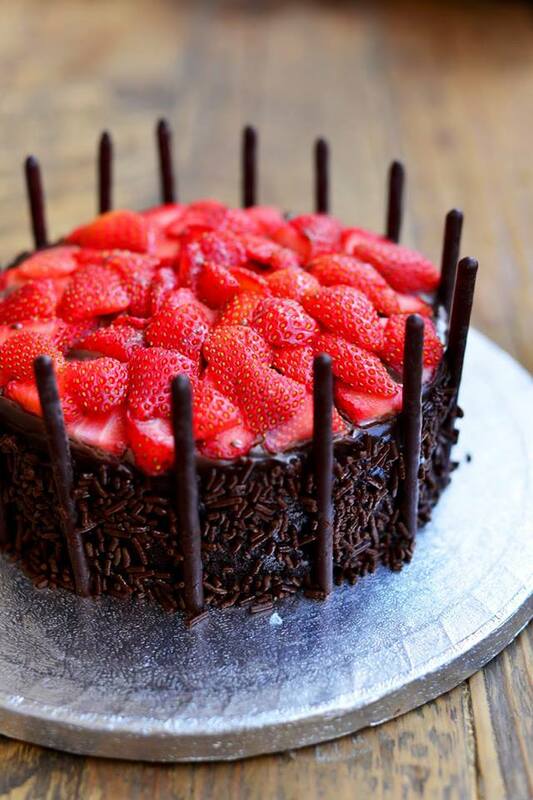 I recently served this cake with raspberry coulis and garnished the cake with almond flakes, topped it with some fresh berries and it looked very pretty! I work at a fun company and any commercialized festivals or days get celebrated with quite a gusto. With half of the team who loves to eat, our lunch conversations are discussions about where we dined last night or which is the new place we should order office lunch from. 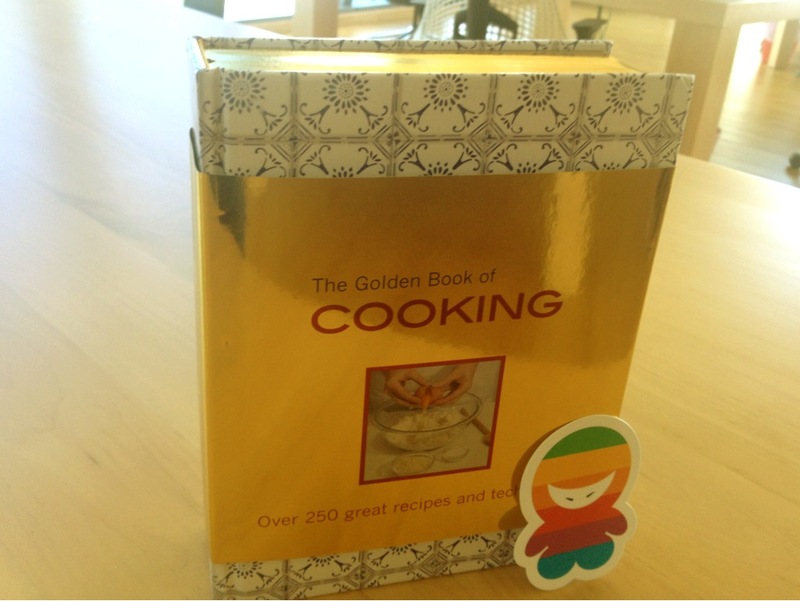 On Valentine’s Day this year, we had our version of Secret Santa and I got gifted a cookbook by a dear colleague. My love for cooking and cookbooks is well known in my co-workers. My subscriptions of BBC Good Food, BBC Housekeeping and Ahlan Gourmet land at my work place every month. I got gifted the “The Golden Book of Cooking” I love this since it stays true to the classics and the recipes have not been played around with. 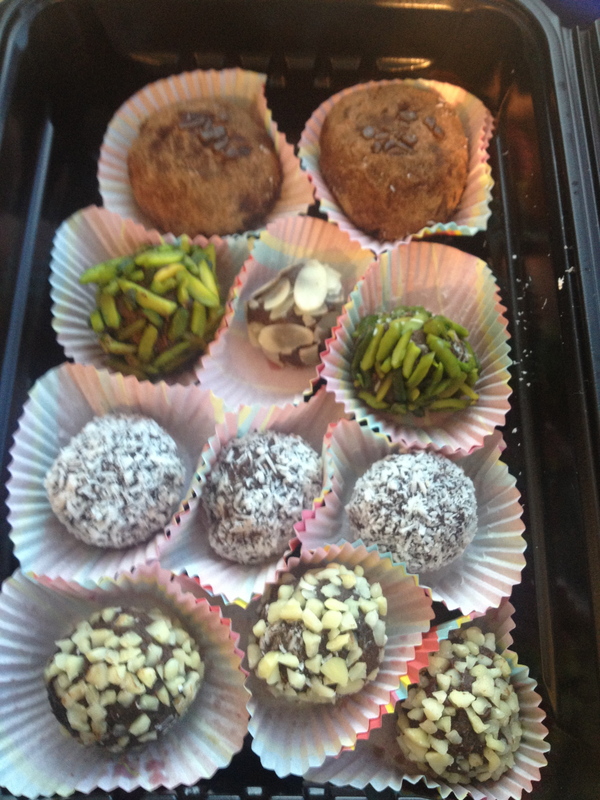 I promised my colleague I would make him a sweet treat from the book and hence the truffles. I have adapted this easy to make and more easier to devour them. So one evening post work, we settled with our coffee mugs with Burj Khalifa (Yep! Flaunting) as a backdrop and relished these bite sized treats. In a saucepan, heat cream over medium heat and bring it a simmer. On a double boiler, melt both the chocolates. You may want to coarsely chop the chocolate bars or simply break them with fingers. Once the chocolate is melted, add butter and cream mixture and blend well. Adding butter to the mixture gives a nice sheen to the mixture. Take the mixture off heat and refrigerate overnight or for a minimum of 3 hours. Use a melon ball scoop to make small balls. Grease your hands well with butter and shape the balls. Coat the chocolate balls with descicated coconut, cocoa powder, almonds, pistachios, sprinkles or even with drinking chocolate. 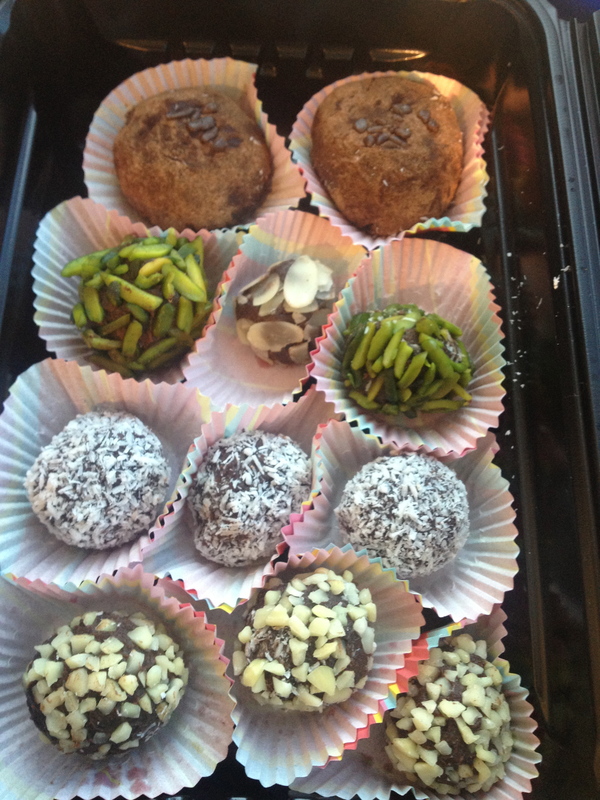 Refrigerate the truffles for some time so that it acquires a nice form. This mixture gave me about 22 truffles to be precise. The truffles would stay well for 3 days if refrigerated. You can also make them in batches and give this as favors to guests after dinner.